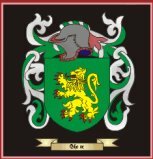 Sir Arthur Shaen, 2nd Bronet, of Kilmore, Co. Roscommon, was the only son of Sir James Shaen. In 1660, Sir James was made Collector and Receiver-General of the Province of Leinster for life. Sir Arthur succeeded to the title on his father's death in 1695 He was High Sheriff of Co. Mayo in 1708 and in Co. Roscommon in 1709 and 1718. He married twice and had three daughters. He died at Kilmore on the 24th June, 1725. The story of how his second marriage came about was passed down from generation to generation. Sir Arthur undertook a trip to visit his properties in Westmeath and Mayo. He left Dublin and arrived on New Years Eve in Togherstown, 5 miles west of Mulliger, the residence of Morgan Megan. Next morning the party met for breakfast and Sir Arthur had a New Years gift for his hostess and begged her to let him put it on her. After receiving the gift she said 'I regret I have nothing worth your acceptance as a New Year's gift -- except one of my daughters' It was all the same to her which one of them. Sir Arthur was dumbfounded. Which of my daughters do you like best? I'll marry them both, said Bryan O'Linn.